Drum Corps Europe recently announced the location of its 2008 European Championships to be held in Kerkrade, the Netherlands at Parkstad Limburg Stadium. 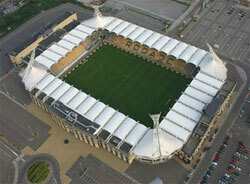 The venue is home to the Dutch football club Roda JC. Located in the southeastern part of the country close to the German and Belgian borders, Parkstad Limburg Stadium will seat 3,000 spectators – 500 more than Sparta Stadium, site of the last three DCE Championships in Rotterdam, the Netherlands. "We think this is a fantastic venue for the DCE Championships," said DCE Chairman Marcel Matthijsse. "It was not easy to find a good stadium, because most football clubs are not very keen to allow corps to march on their [fields]. But Roda JC has a lot of experience with this type of event. They also host the World Music Contest every four years." The DCE Championships will be held on Saturday, Sept. 28 and feature 22 of the top European corps from countries including the Netherlands, Germany, the United Kingdom, Italy and more. Learn more about Drum Corps Europe and the 2008 DCE Championships.